Saturday morning. My laptop sits before me. Coffee to my left. My Dropbox account open. Earbuds in for focus. I am creating a surprise photo album for my daughter for Christmas. Once I select the photos, I’ll send them to Target or Shutterfly to be printed. My kids are playing independently. My son with his matchbox cars. My daughter at the kitchen table, drawing and writing her letters. My wife is meal planning. The first photo dated in my Dropbox account is of my dad at Carter’s Mountain Orchard. The date is November 2, 2008 — my sister’s birthday. The next set of photos are of my wife’s hand, January 17, 2009 — the day I proposed to my wife. Roses are scattered on the floor. A few rows later is of an empty crib with an empty bookshelf. Next is my wife holding my daughter in her arms. Annabelle, fresh out of the womb. Her eyes are swollen. A hat rests on her head. Annabelle is home now. The crib is no longer empty. She stares into the camera, eyes wide. She lays in the floor, my dog beside her keeping her safe. She’s crawling now. Then standing. 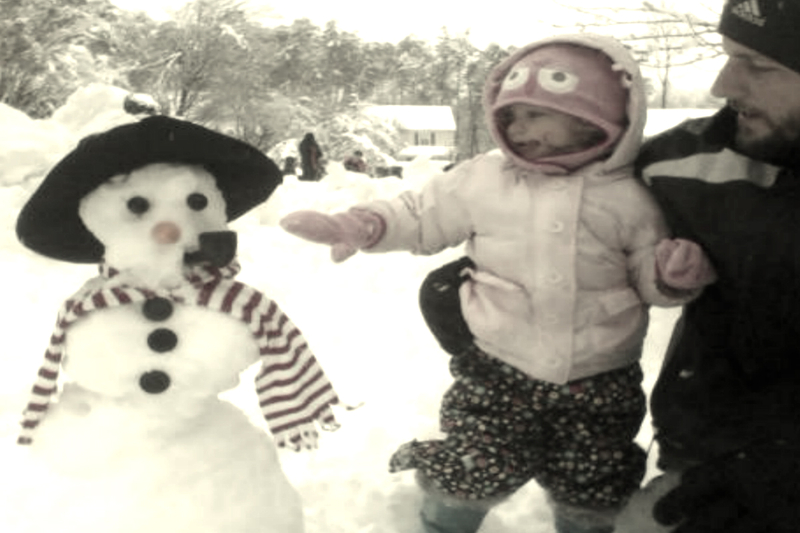 She stands proudly beside her first snowman. My wife’s belly protrudes again. There is a tower of diapers at my work cube my co-workers have surprised me with. My son has arrived. His sister sits by him, beaming. The chorus loops back around, returning. If you enjoyed this, consider subscribing to receive notifications of new posts by email. Nice way to begin a Sunday morning…thank you!